Visit our store to Buy NOW! "The end of apartheid did not mean the end of the devastation to mind and body brought on by intense poverty and oppression, and the persistence of memory. 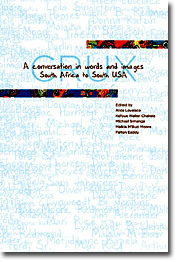 Welcome to CRUX: a conversation in words and images. This issue focuses on South Africa and the Global South USA. We hope this little book will be used as a resource to educate those with an interest in the intersections of South African history and politics with their counterparts in the USA. CRUX illuminates roots and trails that connect both places. We talk about getting to the crux of a problem. We are grateful to have submissions from a multicultural group of people who speak from multiple sides of this conversation. The diverse voices are African, Caucasian, Asian, old, and young; from South Africa and from across the U.S.A.
POETS / WRITERS : Walter Kefoue Chakela, Dennis Brutus, jessica Care moore Poole, Lynn Marshall-Linnemeier, Lisa Tuttle, M. Ayodele Heath, Mary Hames, Khadija Tracey Heeger, Bonile Ngqiyaza, Deena Padayachee, Joan Kerchhoff, Kodac Harrison, Arthur Charles Ford, Sr., Ken McManus, Louis Reyes Rivera, John Oliver Killens, Eugene B. Redmond, Leila Singleton, Malaika Favorite, Darlin' Neal, James E. Cherry, Donna Katzin, Michael Simanga, Felton Eaddy, Theresa Davis, Sara Jahannes, Lynwoodt B. Jenkins, Mari Rice, Motjidibane Bapela, Kemi Bennings, Donald P. Stone, Jim Alexander, Malkia M'Buzi Moore, Tyrone Jones, Ja A. Jahannes, Robert Earl Price, Lita Hooper, Joop Bersee, Dazon Dixon-Diallo, Folami K. Abiade, Tamara Madison, Anthony Kellman, Collin Kelley, Maserame J. Madingwane, Tandi Gcabashe, Azila Reisenberger, Sonette Steyn, F. Geoffrey Johnson, Karen G., Ben Cashdan, Fatimah (debra f. medows), Ronnog Seaberg, Brett Beiles, Marcellus Muthein, Tiyani Camille Randolph (Blakkaufi), Gertrude Fester, Alice Lovelace.